A Tulsa man shot and killed a man breaking into his house near 51st and South Lewis Tuesday morning. The same homeowner shot another burglar five years ago. Police said the intruder’s name is Donald Stovall. The homeowner is Charles Sweeney and he said he did what he felt he had to do to protect himself. Charles Sweeney said noises coming from his bathroom woke him up. The first thought that ran through his head was someone was breaking into his house. “I grabbed a pistol which is right there where I sleep, and it was only about another three or four seconds and he comes into view and blam boy that 9 millimeter is real loud inside the house,” said Sweeney. Sweeney said he shot the man in the chest and called police. “When he clenched up his chest he says ‘I’m sorry I’m sorry I’m sorry’ he retreats back to the bathroom and he tried to get out the same window but he didn’t make it,” said Sweeney. Tulsa Police said Donald Stovall died inside Sweeney’s house. This is not the first time Sweeney has shot a burglar in his home. A man named Michael Watts broke into Sweeney’s home in 2013. Sweeney shot him too, but he lived. “He goes down I run for the phone he gets back up shoves my air conditioner out of the way and takes a high dive right out my second story window,” said Sweeney. And while Tulsa Police investigate, they say people do have a right to defend themselves. “If you are in your home and you have an intruder come in and you feel that you are in fear of your life or the life of someone else who maybe in your home, you are well within your rights to defend yourself,” said Captain Karen Tipler. Sweeney said he just wants people to stop breaking into his house. “He got inside the interior of my house and I didn’t know if he had a weapon and I thought my life was in danger I shot him, and I’ll do it again,” said Sweeney. I just have two quick observations. First, home invaders are always armed. They may have a firearm, or they may have a cutting tool of some sort, or they may have only their fists. Fists can kill. All home invaders are always armed. It’s true, so assume it is so in every instance and for every circumstance. Second, this guy shouldn’t have been yammering and yakking to the police. He should have let his lawyer do the talking for him, and that should have been an immediate phone call. No exceptions. You have a right to representation and defense, and that’s what your attorney is for. Just as he shouldn’t have been yammering and yakking to the police, he sure shouldn’t have been doing it to the television cameras. Just stupid. Shut up and let your attorney defend you from the outset of the event, not after stupid, exaggerated, incorrect and nonfactual things have been said in the heat of the moment. Grillo has a reputation in this part of town. And even if he didn’t, most folks wouldn’t want his type around. The crystal meth has gotten the better of him, his eyes beginning to retreat into his skull, his naturally dark skin fading to an ashen grey, paper-thin, precariously suspended over protruding cheekbones, threatening to rupture at any moment. “Anywhere else in the world, psychopaths are a problem. But here, they’re an asset”, an adviser to the group tells me. Grillo is valuable to them – a psychopath perhaps, but a useful one. Not to worry, I’m certain that there are no warlords or killers in any of the good folk coming across the border on a daily basis. As Jeb Bush said, “they come for love.” And I’m certain that there are no war refugees in the crowds either. As I foretold, the troops at the border aren’t armed because they aren’t under arming orders and do not have border security as their mission. But even if they did, they should never use weapons and the borders should be flung wide open. If you don’t think so, you’re a hater and a racist. As I’m sure you’ve been told many times. Do you manufacture assault weapons for civilian use? Do you sell assault weapons for civilian use? Which firearms does your company agree to not sell to civilians? Do you require your dealers to conduct background checks? Does your company have a plan in place to invest in gun and ammunition-tracing technologies? Do you use, at a minimum, industry best practices for inventory control and transactions? Toledo Mayor Wade Kapszukiewicz says he hopes other cities will follow his lead, given that the city’s $150,000 annual budget for firearms, ammunition and parts is not likely to put a major dent in manufacturers’ bottom lines all by itself. To my knowledge there has been no public response from a manufacturer to the policy, but I have a few suggestions. First, it is interesting to note that the city did not say what answers would be considered to be “successful,” or how many answers a company has to get “correct.” But one can hazard a guess as to what they want to hear. And thanks to the poor wording of their questions, it is likely most manufacturers can tell them exactly what they want to hear, even if they sell the wildly-popular modern sporting rifles. I like his suggestion for “another idea” better. Just say no. Do not sell firearms of any kind to the City of Toledo, at any time, for any reason whatsoever. I don’t like the classification of something as an “assault weapon,” any more than I like the gun rights crowd (us) trying to argue the contrary, i.e., that there is no such thing as an “assault weapon” or that AR-15s aren’t “weapons of war.” Virtually every weapon, from bolt action rifles, to shotguns, to revolvers, to rocks and spears, have been weapons of war, and all weapons can be used to assault someone or some position. Don’t argue semantics. When we do that we just adopt the language framework of the enemy. Just refuse to sell the firearms to the Toledo police department. It’s for their own good. After all, if the cops have guns, they’ll just execute a no-knock raid and cause some unsuspecting homeowner to think there’s a break-in, ending with the imprisonment of the homeowner. Or something else nefarious like that. “Nowhere in the Bible does it tell us that we should not protect individuals,” Rev. Don Stewart said. Former FBI Assistant Director Chris Swecker said the chaos of an active shooter situation would be tough for an officer, let alone for a civilian, to deal with. “I’m not a big fan of having private people inside churches or schools that are armed simply because first responders will not know who is the bad guy and who is the good guy,” Swecker said. This is a remarkable and sad tale on the state of affairs within the Christian community, but also a recapitulation of what we already know about law enforcement. First of all, if the church “wrestled” with this decision, the church has a poor teacher. Framing this as being allowed to do something not expressly forbidden in the Scriptures is wrongheaded way to look at it, and theologically ignorant. We’ve discussed this many times before, but it bears repeating. The Holy writ is a unity, with Christ as the scarlet thread running throughout. The words of the O.T. are no more in contradiction with Christ than the balance of the N.T. There is progressive revelation and development of the covenant, but there isn’t any embarrassing contradiction. We needn’t turn to obscure passages or tangential concerns to justify Biblical self defense. As we’ve noted before, the basis for it is found in the Decalogue. If you’re willing to sacrifice the safety and health of your wife or children to the evils of abuse, kidnapping, sexual predation or death, God isn’t impressed with your fake morality. Capable of stopping it and choosing not to, you’re no better than a child molester, and I wouldn’t allow you even to be around my grandchildren. It’s not that the Scriptures don’t expressly forbid self defense, but rather, they command it on your behalf and on behalf of those who cannot do so themselves. It is an ordinance from the Almighty. This is true whether the state approves of your self defense or not. As for Former FBI Assistant Director Chris Swecker, he is an evil man. His position is that for no other reason than potential confusion among respondents to the crisis, he opposes self defense. He’d rather see dead bodies and have Hazmat on the scene to clean up the blood than see confused LEOs when they get to the scene of a shooting. It takes a special kind of hardness of heart to say such a thing. He will suffer for this belief one day, but until then, ignore and even avoid such men. They are dangerous and deadly wherever they go, whatever they do. Via WRSA, this article is a nice summary of what I take to be the delivered wisdom on the subject. I’ll let the readers peruse the subject material and make comments, but this one graph is worth the work to develop it. While Pete focuses on the fact that peaks out at about 20″ (and properly so), I’ve usually taken the popularity of 18″ barrels as evidence that there are tradeoffs, and those additional 2″ means added weight to the cantilever for very little increase in meaningful muzzle velocity. 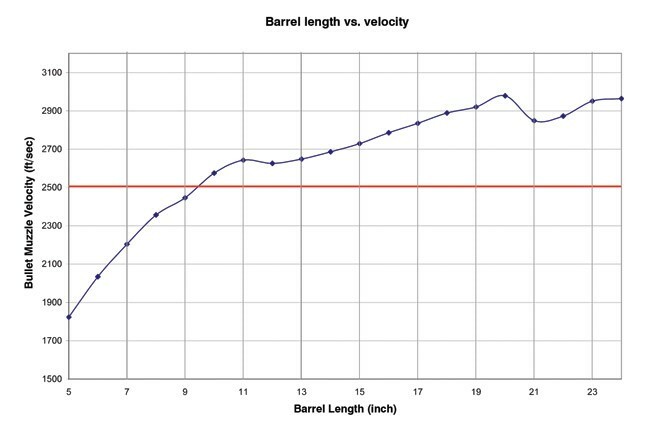 At any rate, take note that your 16″ barrels (or shorter, 14.5″ with a pinned flash hider) are near a flatline in performance, and that the very short barrels on pistol ARs are meant only for CQB. Each tool in its own shop. They all have a purpose. Is The Second Amendment Really Obsolete? Via WRSA, MHN has a very interesting and riveting take on what forcible confiscation of guns would look like in America. Actually, I think it would be much worse, and I’ve said so and described it before. However, take this with a grain of salt. This is what unrestricted warfare against American gun owners would look like. As I’ve said many times before, this isn’t how it will go down. It will be a gradual drip, drip, drip of increasing infringements, all codified and substantiated by the court system as legitimate, mind you, but all designed to target gun manufacturers and gun owners with increasing difficulty. Consider this. I recently covered this, and at least some readers guffawed. But my prediction has been proven out. Then consider this. S9191 “requires a person applying for a license to carry or possess a pistol or revolver or a renewal of such license to consent to having his or her social media accounts and search engine history reviewed and investigated for certain posts and/or searches over a period of 1-3 years prior to the approval of such application or renewal,” the draft bill states. If the bill passes, investigators would be able to look for posts or searches that contain threats to the health or safety of others; intentions to carry out an act of terrorism; or commonly known profane slurs or biased language describing the race, color, national origin, ancestry, gender, religion, age, disability or sexual orientation of a person. You’d better have records, boys. You’d better not ever have to use your firearm in self defense. You’d better register your weapon with the state, and you’d better watch what you say and how you say at all times, even in private. Gun manufacturers had better never issue public stock or their stockholders could shut them down. The banks are another story, and gun manufacturers had better never take out a loan for expansion or building of any kind. You get the point, I think. From money, to driver’s licenses, to professional licenses, to statements made in the workplace or over the internet, FedGov is watching you (as is the local government, apparently). The intent is to boil the frog, not go to war with him. Do you understand? Don’t be stolid. Be thinking men and women.